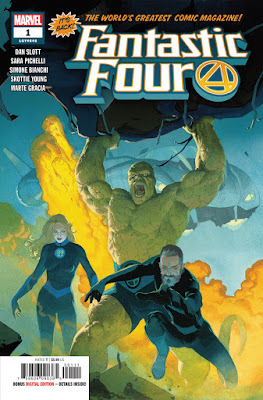 Andy H: Well, this is it true believers, the return of the Fantastic Four! 'BECAUSE YOU DEMANDED IT' has become a much overused phrase in the world of comics but this time I think it fits. The FF have been much missed by fans over the past few years although there has been some reduced FF goodness recently with the excellent Marvel 2-In-One. We've got a great creative team in Dan Slott and Sara Pichelli who I really believe can deliver the First Family of comics back to the top of the pile. Also returning this month is a familiar looking Vertigo lineup. Starting in the pages of Sandman Universe #1 we're reunited with, Sandman, Lucifer and Timothy Hunter and introduced to the House of Whispers. While Vertigo never disappeared completely from the shelves, it has been thin on the ground. It's going to be great to have a bit of choice again and from such well-loved titles. Amazing Spider-Man #3 continues the latest run with gusto - I wasn't sure if Ryan Ottley would fit as a Spidey artist (only because I was so used to his long, long connection with Invincible) but I shouldn't have worried. Ryan's work is spot on and Nick Spencer has made an immediate impact on the title and character. Joëlle Jones has done much the same on Catwoman, so Catwoman #2 is an obvious addition to this week's pull. Great writing and great art from Jones has really put Selina Kyle back on the map and out of the shadow of the Bat! Finally, time to try something a little bit different - a little bit 'out there'. Time for Black Badge #1 from Matt Kindt and Tyler Jenkins. An elite group of boy scouts out to fix the world that adults have broken, armed with their wits, a little C4 and very possibly a Swiss army knife. Sounds totally bonkers but that's the great thing about comics: concepts and ideas that may not work in other media can and do work, on the printed page. Jo S: Last week’s list looked a tricky standard to match, with The Seeds, Batman and Mister Miracle all showing off the precipitous heights comics are capable of reaching these days, but some big hitters nevertheless step up to the plate with this innings. The Dead Hand is still not quite showing all its cards; a deepening mystery nestled in mounting tension as the founders of the community fight to keep the truth from leaking out, and Oblivion Song looks to be turning the intrigue up a notch as Nathan and his brother begin to work through the huge differences in experience imposed on them by the Transference. This time last month I was enjoying a bountiful clutch of newly laid issue #1s and this Wednesday they hatch three siblings: She Could Fly set up a complex picture of a damaged teen living with the daily torment of OCD, terrifying and gripping at the same time, Joëlle Jones’ lithe and action packed ‘solo’ Catwoman story was whisker-lickingly delicious for all us fans of the PVC-clad power-kitty and, truly going from the sublime to the ridiculous, Farmhand (gruesome’s the word) opened a tale of weird science and weirder agriculture packed with puns both fresh and corny. I still keep a spot on my list most weeks for something new: this time I'm going with the advice to ‘follow the creators’ again. A new Matt Kindt-Tyler Jenkins collaboration, so exquisitely demonstrated in Grass Kings, is not something I can pass up, so I'll give Black Badge a try, in spite of my immediate reaction, “Scouts? 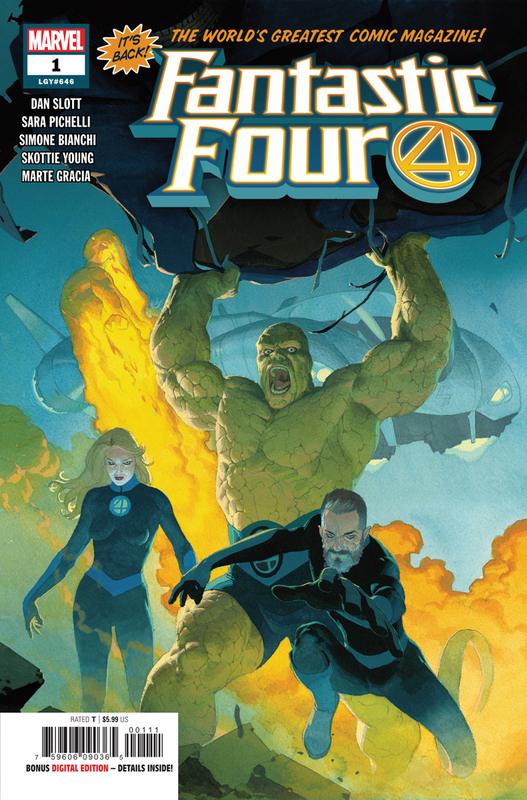 Um, really?” Finally, I really would have to hand in my PCG cap and woggle if I didn't at least give a first issue try-out to a certain Marvel quartet… Dan Slott and Sara Pichelli team up to bring back the Fantastic Four PLUS KITTENS. So that's a done deal.